Maggie Lapinski has had some time to figure things out in Liberal. After one season coaching Eisenhower Middle School cross country and track and last year assisting LHS cross country and track Lapinski is stepping into the head coaching role. She will lead Liberal cross country next fall. She replaces coach Tyson McGuire. This is her third year in Liberal. Maggie is from Canton, New York, a town of about five thousand in upstate New York. 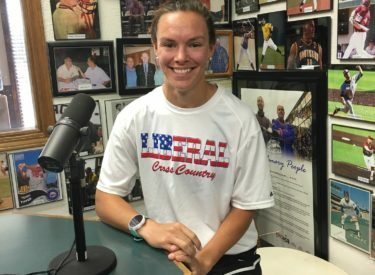 She ran track and cross country collegiately at North Central in the Chicago area. Maggie won the International Pancake Day race in 2017 in 61.06. Liberal’s boys and girls both expect strong teams next fall returning most of their team including Katie Horyna, Xavier Perez, Tony Borunda, and Javier Carillo who competed at state last year. There are summer cross country workouts with fun games on Friday at 8 weekday mornings. The runners, high school, middle school, and younger, are meeting at Country Club Park this week and Harrison Circle Park next week and will alternate weeks at those two parks.